Clicking on the title will bring up DP's Easter egg entry for it. There’s also a $50 bounty for any as-of-yet undiscovered hidden names/initials/messages (i.e. those not already in our Easter egg database) that can be revealed while playing a game - be sure to check DP’s Easter egg section for a current list of known Easter eggs (Note: new or "homebrew" games not applicable). If you have an answer to submit, or any questions about the contest, please email us. 8/11/2011 Frantisek Houra found hidden messages in both Atari 8-bit AIR STRIKE II and CAPTAIN STICKY'S GOLD! 6/19/2011 Don Hodges deduced how the Solar Sailor's appearance works in arcade TRON! 2/7/2011 Don Hodges analyzed Atari VCS/2600 GUARDIAN and found there's no code for awarding bonus planets (at 50,000 points). ● "hi Jon" is coded as graphics in the program (see entry). It's currently unknown whether or not they can be triggered to appear onscreen. ● The initials “LR” (for Lyle Rains), “OR” (for Owen Rubin), “Ly” (for ? ), “Mh” (for Morgan Hoff), and “PM” (for Paul Mancuso?) can be found in the program, coded as graphics (see entry). According to Rubin, it’s quite possible these can be triggered to appear on the screen! ● The initials “OR” (for programmer Owen Rubin) can be found in the program, as graphics (see entry). It's currently unknown whether or not they can be triggered to appear onscreen. ● According to programmer Ed Rotberg, the prototype version has a somewhat risqué ending sequence that can be triggered to appear, but this was completely removed from the release version. ● Do any more of Bob’s games have Easter eggs left in them? The remaining titles are Holey Moley, Rampage, RealSports Volleyball , Road Runner, and Stunt Cycle (inc. the Dukes of Hazzard variant). ● Dan Oliver mentioned in an interview with the 2600 Connection newsletter that one of his games (Laser Gates, Rescue Terra 1, Space Cavern, or possibly Telepathy) contained an undocumented (?) feature that reconfigured the joystick for a left-handed player. ● Is there a way to trigger M. Peter Engelbrite’s initials to appear? ● Does this contain a hidden name/initials? ● It's very possible that the initials for programmer Peter C. Niday are hidden somewhere. ● Rob Fulop claims that the “escape” ship (shown at the end of Atlantis and Cosmic Ark) is hidden somewhere in the game somewhere, but he doesn’t recall how to uncover it. ● Programmer Steve DeFrisco’s initials are hidden in the game, but he doesn’t recall how to trigger them. We found a possible location of the initials in the code, at byte offsets $3da1-$3da5. ● Steve Woita revealed/confirmed that there is a way to change “CRAZED WAVE” to “WOITA WAVE” (picture #1) but he doesn’t recall how to do it. ● According to an interview with programmer Howard Scott Warshaw (in the Winter 1999 issue of Classic Gamer Magazine) a Yar will fly up through the treasure room (inside a mesa) when you start digging. It depends on the right configuration of (three?) items in your inventory. Chances are the flying Yar doesn’t exist, but is it possible that “something” happens with the right inventory? ● Programmer Steve DeFrisco mentions his initials might be hidden in the game, but he doesn’t recall how to trigger them. ● 2 bugs are rumored to be in the game: (1) In any 3-player games, it will occasionally not give the ball back to continue after a point is scored. (2) You can literally "catch" the ball by jamming it between your shield and the edge of the screen. 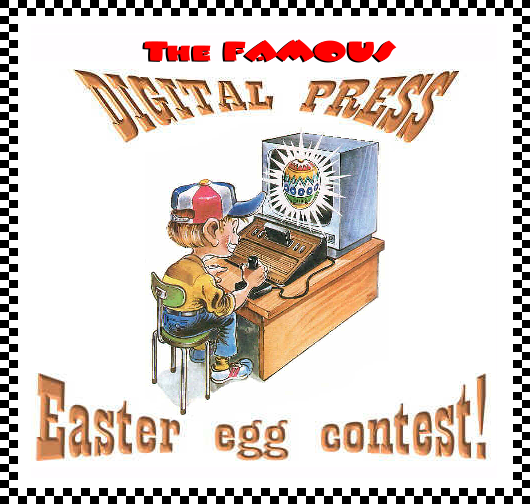 · According to some Analog magazines, one of the Easter eggs hidden in the program is a game. To date, 2 color demos and a method to revealing two names have been found in some early prototype versions. The released cartridges with the Easter eggs were rumored to have been recalled, but we've heard approximately 80k carts were made before Atari found out about it and had them removed. ● Programmers Gary Stark and Bruce Poehlman admit to putting a few hidden extras in the game, but they don’t recall how to trigger them. One that’s been seen is the Starship Enterprise will sometimes make a brief appearance (by the sun) when recharging. The graphics for it may be at bytes $3a46-3a48. Each hidden extra is being paid separately. ● According to programmer Eric Manghise, there’s a way to turn the invaders into his initials, but he doesn’t recall how. It may involve shooting invaders in a certain order. ● According to the May/June 1989 issue of the Atarian magazine, there’s a secret code that lets you select different stages to start at, but the article doesn’t mention what it is. ● The manual mentions to look for special surprises during a game. What are they? ● Does an Easter egg similar to the ones in the Atari versions exist? Note the blue “pathway” through the spider’s lair. By using a Super Action controller (and pressing all the trigger buttons) you can fall through the bottom floor, but is there a way that's intentionally programmed? ● The programmer’s initials appear in the sky, but it’s unknown what triggers them. ● Does an Easter egg similar to the ones in the Atari versions exist? ● The solution in DP's FAQ section is the most accurate one online, but it's still not complete. We're looking for a step-by-step solution that solves the game.